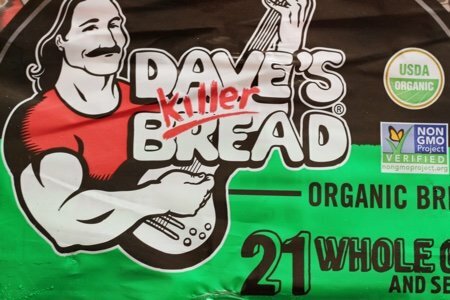 America’s favorite organic sliced bread – Dave’s Killer bread - is sort of amazing. It features “Dave” on the packaging and seems almost quaint in it’s presentation. My husband, Matt, found this at Costco. I don’t usually want him to shop there because he tends to come home with a ridiculous amount of stuff. Snow storm? No worries, we can survive Armageddon. I happen to love Ezekiel bread and Alvarado Street sprouted bread so Dave’s Killer bread had a very high bar to jump over. Right away, I checked the nutrition facts as Matt is far less picky than I am. I put it to my “bread test” to ensure it is nutritious – is the first ingredient whole grain? Yes! Does it have more than 4 grams of fiber? Yes! Does it have less than 4 grams of sugar? Uh Oh – 5 grams – but not far off. But, it tastes so good! I love all the seeds on the crust. It has a ridiculous combination of seeds and grains: flax, sunflower, sesame, pumpkin, millet, barley, rye, quinoa, buckwheat, poppy…..
And it manages to have 45% of your daily value of Manganese, 20% of your daily value of Selenium, and 10% of your daily value of magnesium in every slice probably because of all of the seeds. It doesn’t taste like cardboard – it is delicious – and you only need one slice to feel full. I think the 5 grams of protein have something to do with that. Dave’s Killer bread has become my breakfast of choice. 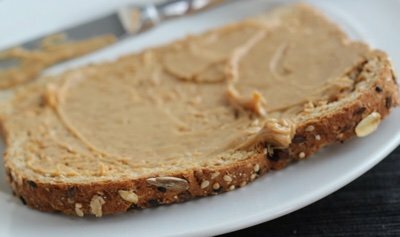 I eat one slice almost every morning toasted with either peanut butter or avocado. After this purchase, I have allowed Matt to go to Costco by himself more often. I just need to build an addition to store all the paper towels he buys. Have you seen Dave’s Bread? What do you think of it? Lisa, I absolutely love, love, love Dave's Killer bread! One slice is really enough. Thanks for what you do--I always look forward to what you have to say! You found it at Costco? I've been wanting to try this bread but not willing to buy the 6 loaves required to order on their site. I'll have to keep an eye out! I had only been able to find this bread at a local organic market and they had it frozen already. Recent trip to Sam's Club...hello found it fresh and two loaves for the price I was paying for one at the organic market...win!!! My family loves this bread! You can buy Daves Killer Bread at Safeway. This bread is sold at Krogers. LOVE Dave's Bread - they make a 60 and a 70 calorie one that I get since I am a WW - I get it at Safeway here in CA. When I they are sold out I usually buy the larger loaf and eat 1 slice like you did - it is enough - no bread like it IMHO - have even seen it at Grocery Outlet (which I love) - they have amazing products there from time to time - love your Blog - so informative - Thank you - firs time I am commenting!! The story of this bread is as great as the bread! They're in Oregon (yay, Oregon!) and not only is this the best bread out there, but they are incredibly philanthropic---and the story of their beginnings is inspirational. Read their story--then eat their bread! My only concert is it has so much sodium. If you make a sandwich, you start off with 360 mg of sodium without putting anything on it. I'm sure it's used as a preservative. I wish they made a lower sodium version. Once you reach age 50 or so, you are supposed to keep your sodium intake around 1500 - 1600 mg per day. Those two slices of bread are already 25% of that! 4 SP is too many for me to sacrifice for a single slice of bread, no matter how good. Will look up SP on the smaller, lowest calorie variety (anyone know the SP offhand?? ), then keep my eyes open for it at Grocery Outlet. Thanks for the tip! Lisa, I just love this bread...Even my Vegan son-in-law eats it..One slice is so fillimg... YUM!! Great post! Next best thing to sprouted bread! Get healthy America! My whole family loves that bread! 4 pts for one slice is WAY too much for me. I need the "sandwich" experience. I read above that someone found a lesser calorie one, that is what I would be interested in. I live in the midwest and found it at our Sam's. First taste was in Az. You can call them and they will tell you were you cab find it in your area. Love it, so tickled I cab finally get it here. OMG!!! Dave's Bread has been and continues to be my cocaine! The idea of portion control goes right out the door when I'm jonesing for really good bread. Thank God that doesn't happen too often. Careful, this stuff is addictively awesome! Just finished a slice this morning with a little PB and 1/4 banana. Sounds delicious, but at 22 grams of carbs per slice, way too high for a diabetic. Simply the best sliced bread out there. I love this bread. I have been eating Ezekiel bread for years. now have switched to Killer Dave. I buy the thin sliced 60 calorie one. Publix stores here in Fl stock it on the bread aisle. It really is delicious. My husband never liked whole grain bread until Dave's killer bread. When I ask him to pick up a loaf of bread this is what he gets. Makes me so happy! Here in the Chicago area I have found Dave's Killer Bread at both Meijer and Mariano's. Dave's comes in thin sliced as well, only 60 calories and well under 5 grams of sugar!! Amazing stuff!!! The bread feels like you are eating a pot scubber pad. I am not a fan. I cut eat slice in half to make a sandwich. However, has anyone noticed that if left on the counter for a while it does not Mold? Could the grains be Radiated? I also love newly found Dave's Killer bread. My King Kullen has thin sliced which is only 60 calories per slice. I have to try Ezekiel's.